Barrier Medicated Shampoo is a routine shampoo that treats a range of ailments. G E Nutricalm is a natural remedy for nervous and anxious dogs and cats and can also be used for horses. Nutricalm came about as a result of Dr Garry Eckersley’s interest in natural medicine and an integrative approach to animal medicine in general. Nutricalm came about as a result of Dr Garry Eckersley’s interest in natural medicine and an integrative approach to animal medicine in general.He has been using a new amino acid calming agent as a much preferred and completely safe alternative to the phenothiazines such as ACP and benzodiazapines such as valium. In the light of the SAVC directive regarding the use of ACP for behavioural disorders in dogs and cats dated March 2004 (SAVC Newsletter 36), he considered it even more important to provide an alternative remedy that can, and is, being used successfully instead of drugs such as ACP. Nutricalm was initially used in both dogs and cats as a pre-surgical calming agent as well as an anxiolytic for animals traumatised by fireworks and thunderstorms. Being a nutritious essential amino acid blend, Nutricalm takes effect within 20 minutes of ingestion and is effective for at least 4 hours. As a nutritional food supplement, it is free of side effects and, as such, can be safely and legally dispensed by the veterinarian’s receptionist or nurse. 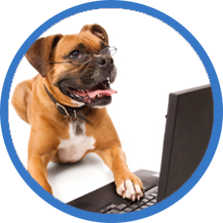 Nutricalm can be used for all dogs, cats, exotic pets, horses and other large animals. At present we are supplying Nutricalm to over 800 veterinarians in South Africa and it is highly recommended by all who use the product. Over 1 000 000 capsules have been used since August 1998. Cats: 1 capsule to effect. Small Dogs: 1 capsule to effect. Medium Dogs: 1 – 2 capsules to effect. Large Dogs: 2 – 4 capsules to effect. We encourage you to give Nutricalm a chance to show you what a difference it can make to the quality of life to your pets, that suffer from any of the previously mentioned conditions. Nutricalm is packed in tubs of 100 capsules. Pricing and recommended retail prices can be obtained by e-mailing our information line. Our products can be purchased from Lakato (Pty) Limited. 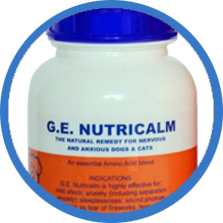 G E Nutricalm is a natural remedy for nervous and anxious dogs and cats and can also be used for horses. It is an essential amino acid blend highly effective for mild shock, anxiety, sleeplessness, sound phobias, car and air travel and eating disorders. It is also a natural painkiller and can be used for senility and behavioural disorders. Nutricalm is safe to use in dogs and cats that suffer from any medical disorder (i.e. there is no known contra – indication). It has been safely used in pregnant animals and in patients with heart, lung or kidney disease as well as in patients with various forms of cancer. Nutricalm is very safe to give to puppies and kittens as well. This would include minor trauma such as dog or cat fights and accidents, falls, fright and other causes of injury. It is safe to use Nutricalm in patients that have a history of seizures (such as epilepsy) and can be used in conjunction with anticonvulsant medications and to calm the patients in the post-ictal phase of seizures when they are often very agitated and confused. Nutricalm is useful for treating most forms of anxiety, worry or distressed patients. It can be used to treat patients that “grieve” the loss of a friend/mate and for some causes of depression. We use it to help calm feral cats and stray dogs and it is useful in patients that find visits to the vet a traumatic experience. Nutricalm is very effective in helping patients that suffer from separation anxiety (e.g. barking excessively or waiting at the gate until the owner returns). Some pets damage the house, chew the furniture, soil the carpets, or display other destructive behaviour patterns. These problems can all be helped with the use of Nutricalm. Nutricalm can be used to help patients that are restless at night and do not sleep well or wake up easily at night and create a disturbance or pace the house. (see Senility as well ). The most important use of Nutricalm is in helping patients that are traumatized by fireworks, thunderstorms, lightning or any other loud noises such as gunshots or a car backfiring in the street. It is very effective wherever thunderstorms are prevalent but also at Guy Fawkes and over New Year or parties when firecrackers cause major trauma to our pets. Nutricalm can be used for patients that do not eat well because of stress or in highly strung individuals with poor appetites , where there is no other medical condition present. It can also be used to help in weight reduction for obesity. Nutricalm can be used for general nervousness and anxiety in pets. Nutricalm is an effective calming agent in obsessive compulsive behaviour disorders, over-excitement, irritability, agitation, distressed dogs and cats, uncontrollable dogs and cats, bad tempered dogs and cats. It is very useful to calm dogs before dog shows and even in working dogs where it does not affect their ability to work (e.g. agility, man work tracking etc.). It can also be used in cats before cat shows if they are very nervous. Nutricalm has proven to be very helpful to the owners of dog and cat grooming parlours and because of its calming effect on the pets they are much easier to groom, wash and cut and generally do not need to be tranquilized with conventional drugs. Nutricalm has proven to be of great help to kennel owners, to calm nervous dogs and cats during their stay in kennels and catteries. Nutricalm is very useful for cats in townhouse complexes, flats or retirement villages where they may roam and spray urine in their own home or a neighbours home and cause fighting between neighbourhood cats. Another important use for Nutricalm is its use before and after moving home. It is very helpful for both dogs and cats in this instance. Nutricalm can be used for naughty puppies where they may be chewing the furniture, clothes or other objects. It is helpful to use Nutricalm in dogs that exhibit excessive barking behaviour, especially in a townhouse complex where the neighbours are disturbed. Nutricalm can be used for minor events where pain is anticipated or has occurred, e.g. minor trauma, teething, pre-operatively or post-operatively. It can also be used for mild joint pain caused by degenerative joint disease and in certain types of cancer where it can be combined with conventional analgesics. Aggression and excessive vocalisation in dogs. Spraying, roaming, fighting and excessive vocalisation in cats. Nutricalm can be used in old dogs and cats where there is a slow deterioration in mental and physical faculties, especially where there is anxiousness, irritability or sleeplessness involved. Introduction of new pets, for working dogs, including agility dogs, showing classes, utility dogs and for dog training. Use for socialisation of adult dogs and puppies. 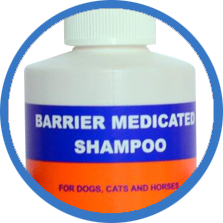 Barrier Medicated Shampoo is a routine shampoo for cats, dogs and horses and can also be used for the treatment of acute superficial pyoderma, chronic deep pyoderma, allergic skin disease with secondary Mallassezia Sp and Staphylococcus Sp pyoderma, primary and secondary seborrhea, demodex or sarcoptic mange and also as an adjunctive therapy for dermatophtosis.